A 7-12. "Pitch and Toss": Children playing pitch and toss, Grey River. There is a description of the game in the Dictionary of Newfoundland English: "You stand away so far, an' you pitch your button. The handiest to the peg, after so many pitches [would win]. C 70-15 The object of the game was to pitch a button from the hole [where you stood] so that the button touched the 'nag' (or stick). C 71-22 Make a mot in the ground with your heel. Stand at a distance from the hole and pitch the buttons." Games and play allow children to develop important social skills and negotiate their world through competition, role-playing, and power hierarchies. Children's games/play evolve over time and reflect how communities respond to social and economic changes. The introduction of electricity, telephones, movies, television, radio and internet has had a strong influence on the game and play repertoire of children. As these technologies grew in popularity, children spent less time outdoors playing traditional games such as Rounders, Hoist your Sails and Run, Pitch and Toss, Duck on the Rock and Bandy Ball. Subsequently, the rules of many of these games have been nearly lost. We would like to document these games and play before that happens. In the new year the Intangible Cultural Heritage Office hopes to collect memories from tradition bearers across the province. Our goal is to explore the folklore of children's games/play through contextual information, such as rules of play, gender and age requirements, type of equipment used and when and where each game was played. If you have memories of playing these games or know a tradition bearer who does, please feel free to get in touch with the Intangible Cultural Heritage Office, we'd love to hear from you! 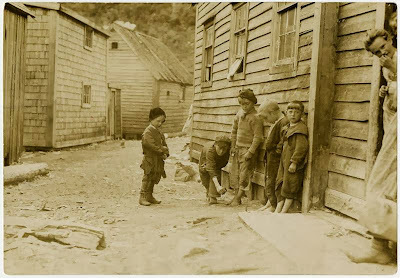 For more on traditional games and play in Newfoundland and Labrador check out our collection on MUN's Digital Archive.